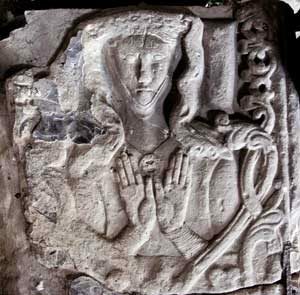 The iconic stone effigy in the porch of Beaumaris church has traditionally been understood to depict Siwan, wife of Llywelyn ab Iorwerth, who died in 1237. Illegitimate daughter of King John of England, wife of one of the greatest rulers of north Wales, she is a key figure in both Welsh history and historical fiction. Perhaps regrettably, the fiction has focussed around her mid-life affair with the marcher lord William de Breos (the central episode in Saunders Lewis’s play Siwan, Ellis Peters’ novel The Green Branch and Sharon Kay Penman’s novel Here Be Dragons). This has unfortunately distracted attention from her importance as a political figure behind the scenes in a crucial period of the Welsh struggle for independence. 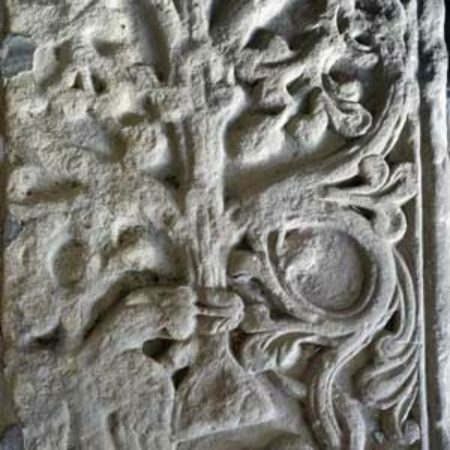 The romantic story also helps to explain why the Beaumaris carving has become one of Wales’s most iconic pieces of medieval art. It appears on numerous websites and has been photographed and drawn for several academic publications. 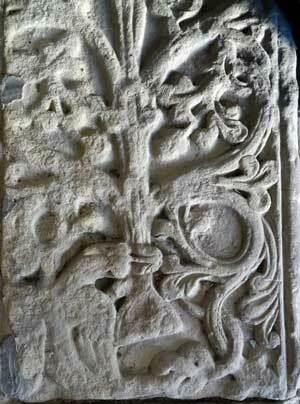 There are particularly good photographs on the castlewales web site; Colin Gresham drew it as the first item in his discussion of medieval stone carving in Wales.According to local tradition (again), the effigy and the stone coffin on which it now stands came from the friary at Llanfaes, the friary which Llywelyn founded over Siwan’s tomb and in her memory. 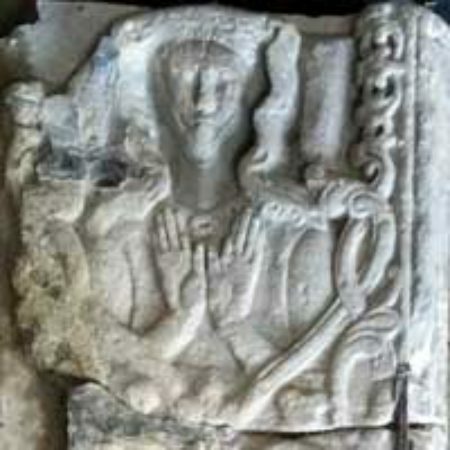 It caused some consternation, therefore, when Brian and Moira Gittos pointed out (in a paper at the Church Monuments Society’s Welsh symposium in Cardiff in the summer of 2012, subsequently published in Archaeologia Cambrensis) that the style of the head-dress on the Beaumaris carving, with the wimple drawn under the chin to give a triangular shape to the face, cannot be found before the 1270s and could even be as late as the beginning of the fourteenth century. In a further paper at the Cambrian Archaeological Association conference in Llangollen in the spring of 2014 they developed this argument further. The biting wyvern, the style of the foliate decoration on the tomb, and particularly the stiff-leaf trefoils at the junction of the stems, are all characteristic of late thirteenth-century work in metal as well as stone. Other features of the carving – the straight posture, the combination of coronet, veil, wimple and brooch – suggest a date in the 1270s or the 1280s. So who is it? The head-dress is badly damaged but seems to have been a crown or coronet. We are therefore looking for someone of royal status. Brian and Moira Gittos suggested that the effigy might commemorate Eleanor de Montfort, wife of Llywelyn ap Gruffydd. She was the daughter of the aristocratic rebel Simon de Montfort and his wife Eleanor, youngest daughter of King John of England (and was thus Siwan’s niece). After several years as a hostage in England she married Llywelyn in 1278 but she died in childbirth on 19 June 1282, leaving a daughter, Gwenllian. She was buried at Llanfaes – but this does not prove that the effigy is hers. By the time she died, Llywelyn was fighting his final desperate campaign against the overwhelmingly greater forces of Edward I. Would he have spent time and money on a statement tomb? There are other candidates. Of these, probably the most likely is Llywelyn’s mother Senana. One of the most shadowy figures of a sparsely-documented period, she married Llywelyn ab Iorwerth’s older son Gruffydd, probably fairly soon after his release from English custody in 1215, and bore him four sons including the rivals Llywelyn and Dafydd. She seems to have been particularly close to her youngest son Dafydd, and she last appears in the record in 1252, when she was at Dafydd’s court in Llyn. It was therefore exciting to read, in Andy Abram’s chapter on monastic burial in Burton and Stober’s Monastic Wales, that Senana was buried at Llanfaes. Abram went on to suggest, on the basis that Senana as well as Siwan and Eleanor was buried there, that Llanfaes may have been deliberately designed by the rulers of Gwynedd as a mausoleum for the women of the royal house, but that it may also have been chosen by the royal women themselves as a burial place deliberately set apart from the male dynastic burial place at Aberconwy. Abram referenced Gwenyth Richards’ Sydney Ph D thesis, ‘From footnotes to narrative: Welsh noblewomen in the thirteenth century’. The thesis added a date of 1263 for Senana’s death: but crucially the only evidence cited for either the death or the burial was a Gwynedd County Council tourist leaflet, ‘Princes of Gwynedd: The Môn Trail’, published in 1996. The leaflet, it transpired, was based on a book, The Princes of Gwynedd: Courts, Castles and Churches: and the information about Senana’s death and burial actually came from Ellis Peters’ novel The Dragon at Noonday, part of the Brothers of Gwynedd series. The Princes of Gwynedd book makes the source clear, but it seems that whoever used the book as material for the production of tourist trail leaflets failed to realise that Edith Pargeter’s work was fiction. It is still possible that Senana was buried at Llanfaes. The date of 1263 would still be rather early for the Beaumaris effigy, but it could be a retrospective memorial, commissioned by Llywelyn or even by Dafydd. Alternatively, although she vanishes from the record after the 1250s, absence of evidence is not evidence of absence, especially in a period when women in general are so sparsely documented. It is possible that she lived on until the 1270s and was then buried at Llanfaes. However, this must remain pure conjecture. The debate over the identity of the effigy has been sharpened by the latest development in the afterlife of the monument. Even when the effigy was thought to be Princess Siwan, it was of obvious interest to those involved in the commemoration of a key period in Welsh history. The Princess Gwenllian Society has raised funds to commission virtual replicas of the Beaumaris effigy and the coffin at Llanrwst traditionally said to be that of Llywelyn ab Iorwerth: the current plan is that these will be part of an installation in Bangor Cathedral but that they will also be accessible on the internet. 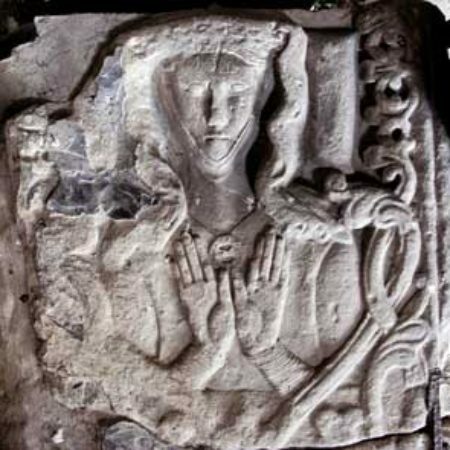 The current evidence suggests that the effigy most probably commemorates Eleanor de Montfort, but that it could be Senana: that is what will appear on the interpretative material for the exhibition. The process by which this provisional conclusion has been reached is an instructive one. It warns us that we need to look at historical artefacts carefully, that antiquarian literature can be illuminating but can also cloud the picture, and that the academic practice of recording, checking and verifying references is not pettifogging nitpicking but crucial to sound research. Above all, the Beaumaris effigy reminds us of the need to look and to think for ourselves.